Prisoners arrives just as America has experienced many of the same devious topics in the current news narrative: torture, vigilante justice, and child abductions. The events of George Zimmerman and Trayvon Martin, Ariel Castro, and the debates regarding the definitions of torture, places the film in a modern light, but it is depicted with a classicism that will prompt high replay value. These topics make the film all the more relevant, but its plot never provokes any form of political or cultural arguments; it is solely focused on its own form. The two young girls of the Dover and Birch families disappear long after the main Thanksgiving course has been served. 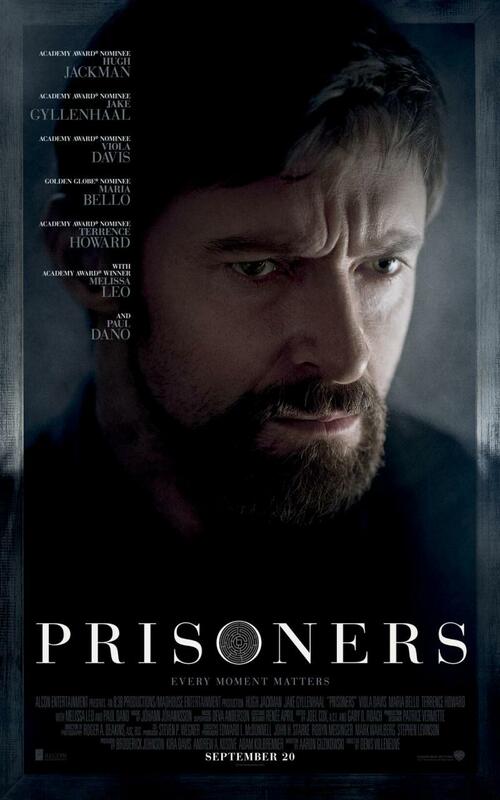 When patriarchs Keller Dover (Hugh Jackman) and Franklin Birch (Terrance Howard) search endlessly throughout the night for their daughters, they contact to the police, which in turn becomes a town-wide mission that goes on for weeks. Prime suspect Alex Jones (Paul Dano) was driving the RV that the two young girls had briefly climbed on just prior to their abduction, but Jones only has the mental capacity of a ten-year old, and the evidence that implicates Jones runs dry. The cold trail even has expert Detective Loki (Jake Gyllenhaal) losing faith. Detective Loki’s name refers to the Norse God who had varying degrees of success in assisting other gods, and in Prisoners, Gyllenhaal’s character experiences the same characteristics. Although he is said to be one of the best, closing each of the cases he’s been assigned, his performance begins to slide into careless mistakes in seemingly routine duties. Dover is a survivalist who is seen educating his son in the hunting deer in the first scene, he has a basement impeccably stocked with every item necessary for a catastrophic event. Alongside this incredibly dark and winding plot, the film features an ensemble cast who provide their most chilling performances. Jackman takes on a character that is just as deviant and cold as those who have taken his daughter. Gyllenhaal conjures his performance in Zodiac. He’s a clean cut guy, married to the job in that cliché crime thriller manner, and despite a neck tattoo, his character unfashionably buttons the very top button of his dress shirts. Then there is Paul Dano, who has never provided a disappointing role, save for Director Denis Villeneuve also crafted Incendies, a 2010 Foreign Language Oscar nominee that was robbed over In a Better World. Villeneuve has arrived as the next non-American redefining American film. He has become a master of slowly building sprawling epics dependent on the viciousness of family legacies. His collaboration with Roger Deakins, one of the best cinematographers working today, is exquisite with its crystal clear clarity that is vivid, but expresses the darkest of thoughts as the wronged venture into the wrong. Together, they have created a chilling film set in the darkest of winters, filled with a puzzle that is indebted to its own maze. One scene deep within the second act has Keller in his daughter’s bedroom. He inadvertently knocks over a small doll house on to the floor to convey the sense that their home has been turned upside down since the disappearance of their family member. Keller tells his son early in the film “Prepare for the worst, pray for the best,” but he deviates from his religion earl on, forgetting his own spiritual proverb. Prisoners says so much about the American mindset and current topics without preaching a social message, and it’s a film that will surely remain among recent greats.